As the days lengthen and the snow recedes and melts away, many adventurers are gearing up for the excitement of the summer season. Colorado happens to play host to many outdoor activities, many of which reside in the foothills and Rocky Mountains. Estes Park ATV Rentals is just as excited as you are to experience the adventures! Our company was founded to provide the best ATV rentals in Colorado, giving customers the joy of taking on those rugged ATV trails with the freedom of a self-guided tour. Fans who have always dreamed of riding a Polaris RZR or any quality Honda ATV will be more than pleased with our top-notch line of vehicles to choose from. While our ATV riding company caters to the thrill-seeker in all of us, it isn’t exactly child-friendly. Today, we’ll take a look at a few more Estes Park activities that you can fully enjoy now that the weather is warmer. With the Big Thompson River cutting right through downtown from the west and Lake Estes bordering the east side, there should be ample room for you to try your luck on the water. Additional locations, such as Mary’s Lake and the Saint Vrain River, give visitors the enjoyment of trying to hook one of our many species of trout. The lakes are also stocked once per week in the summertime to deliver a memorable experience for anglers of all ages. While the average fish in our area sizes up to about a foot in length, reports have come in that you can catch one up to 25 inches! Estes Park is home to sparkling bodies of water and majestic peaks, delivering a memorable experience for you and the whole family. Those seeking an adrenalized time without our top-tier ATV riding adventure will certainly enjoy the town’s Open Air Adventure Park. Located near the tramway, this rope-centered journey gives patrons the ability to maneuver and traverse a variety of obstacles while suspended high in the air. Everyone loves an obstacle course, so why not go vertical with it? Harnesses and helmets help to create an activity that is as exciting as it is safe. Families, birthday parties, and corporate groups can all enjoy the fresh air and suspended adventures here, but be sure to reserve your spots early! While other areas in Colorado are more renowned for their rafting adventures, that doesn’t mean that Estes Park doesn’t have what you are looking for! Our town’s rafting enterprise boasts that they have been providing transport to and from the river for over three decades. Each rafting trip is organized to allow rafters of all ages to enjoy the excitement while being supervised by trained, experienced staff. By focusing on top-notch training, these guides are ready to share their love of the water with you. Anyone looking to “get high” in Colorado will be more than happy to experience the rush of rock climbing and mountain adventuring. Estes Park plays host to a number of outfits that offer climbing, rappelling, and guided hikes to give everyone an up-close and personal experience with nature.The Kent Mountain Adventure Center, for example, is proud to offer personalized itineraries to give you and your group the exact adventure you’re looking for. Birthday groups and newlyweds alike can capitalize on the unique experience, providing visitors of all ages with a memorable time. From expert tours to instructions to exploratory sessions, Estes Park has the right climbing adventure on tap for your climber! 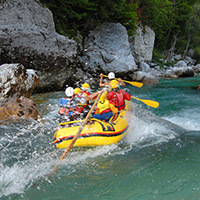 While these adrenalized excursions are great, they may not be ideal for those looking to relax while on vacation. Estes Park also places a heavy premium on relaxation and truly hitting the reset button for world-weary souls. Featuring a luxurious spa, relaxing massage parlor, and river retreat, guests have a number of choices for where they want to get pampered. Our town has the advantage of having a river run right through downtown, giving places like Riverspointe Spa the ability to incorporate relaxing water features into the environment. While your significant other’s group may be itching to try our side by side ATV rentals, you and your pack may be looking more for hot stone massages and sauna soaks. While there is so much to do in Estes Park, there are only so many hours in the day. You and your group will need to do some serious planning in order to maximize the enjoyment you will receive from our stunning town. If you decide that Polaris ATV adventures are necessary, we’ll be happy to help! Estes Park ATV Rentals is proud to provide a top-notch adventure for anyone looking to hit the trail and maximize the adrenaline. We fill up the vehicles and deliver them to the parking lot. All you need to do is fill out the paperwork and show up ready to ride. If you are interested in ATV rentals at our Colorado establishment, feel free to contact us today!